Renowned for our legendary catering and hospitality, we are innovative and reliable partners to corporate events, sporting projects and brand experiences the world over. GIG is recognised for award-winning credentials and thought leadership in guest experiences with a roster of high-profile, long standing clients encompassing sport, music, entertainment, not for profit and corporate sectors. Our aim is to share a vision of enhancing the guest journey through collaboration, knowledge and expertise, ensuring a truly world class experience. We understand the complexity of event catering, often in remote and challenging sites, or at prestigious venues. We are confident in our ability to deliver, and commit to balance commercially sensible and innovative solutions, with broader interests, values and expectations. Our chefs ensure a culinary concept is designed to appeal to a wide audience, reflecting the diversity of expectations, with strong local provenance and subtle influences to enforce a brand message. To do justice to the spirit of hospitality, we believe the final choice should not simply the made on the demonstration of delivery excellence alone, but in extending boundaries of ideas that will continue to deliver more and more each time. Our approach is about being honest about the produce and staying true to roots, no matter the location or venue. Delivering clear messaging through our culinary experiences is the foundation to our success. Supported by robust and accredited management plans, we like to tell the story, make it interesting and make it informative. Forward thinking. Meticulous planning and supplier relationships ensures appropriate cost savings are made, and innovative economies of scale are created. Our chefs amplify quality from local sources to deliver national and international cuisine in a variation of traditional and on-trend styles. Grab and go, interactive live stations, guest Chefs, buffets, canapes, bowl food, formal dining, athlete dining and more. All tailored to the time of day, occasion and audience. Plays a huge part in our approach. We proudly acknowledge that our input helps local companies at home and abroad, and creates a collective of individuals with a wealth of new skills, new experiences and friendships. Premium, refined and lively at all key touch points of our guests journey. Through structured training and event specific training, our team are engaging, personable and accessible at all levels; from welcome desk and front of house servers and bartenders, to our open kitchens and hidden army of star performers behind the scenes. To serve the greater community, minimising impact of our operations on the environment and to promote sustainability is at the forefront of everything we do. We strive to cut energy and water consumption, reduce, reuse and recycle, and source ethical produce. Is what makes GIG, legendary. Our case studies will give you a whirlwind tour of just how we do what we do. Nothing is beyond our GIG team. In fact, we love a challenging brief, and the chance to bring our welcoming and flexible personalities into play for you and your guests. GIG was delighted to showcase a selection of UK themed dishes for a recent meeting of international country participants Expo 2020 Dubai. The star-studded ceremony saw GIG deliver a wide range of crew, media, guest and VIP catering services. Bonnie recently returned from a business trip to Japan ahead of multiple international events that the country are hosting. Her trip included farmers markets, Sumo, traditions and famous sights. Following a highly competitive tender process, GIG has been awarded the Hospitality Services contract. Global Infusion Group (GIG), has been presented with The Queen’s Award for Enterprise: International Trade 2017. 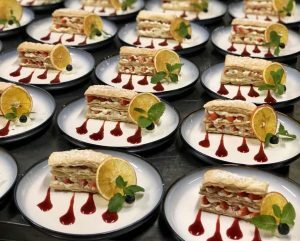 Catering and logistics firm Global Infusion Group feeds the staff and stars at a diverse range of events – from the London Olympics to Coldplay concerts. Literally everything is edible... including the walls! Tony joined Bucks Business First for a radio interview with Mix 96.